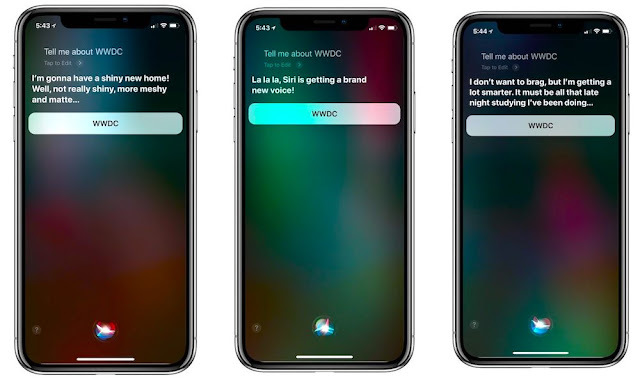 If you take out your iPhone right now and ask Siri about Apple’s upcoming WWDC event, you might get some seemingly exciting answers. When asked about WWDC, Siri will apparently tease a “new voice,” a new “meshy and matte home,” and general intelligence upgrades. Unfortunately, these responses have nothing to do with this year’s WWDC event — at least, not directly. Apple aficionados will notice that those Siri responses directly correlate with announcements made last year. At WWDC ’17, Siri got a new and improved voice, a suite of intelligence upgrades, and a new “meshy” home in the form of HomePod. In other words, Siri isn’t teasing anything new. Instead, the digital assistant is offering a recap of last year’s announcements. That’s a fact that’s likely much to the chagrin of the media outlets and readers who excitedly touted the reports over the last week. Of course, with that being said, it’s certainly possible that Siri will get smarter this year. Will Siri Get a New Voice? Recent reports indicate that Apple is significantly expanding its artificial intelligence and machine learning operations in Seattle — both in actual physical space and workforce. Some of its A.I. endeavors have been published in its own Machine Learning Journal. Taken together with reports that Apple is focusing on quality and performance improvements in this year’s operating systems, and it’s likely that the company will debut new Siri features — which might include upgrades that significantly polish and improve the digital assistant across Apple’s various platforms. In addition, there have been several new rumors which hint at a new HomePod that could be in development. In February, a Rosenblatt Securities analyst suggested that Apple could release a HomePod in the $150 to $200 range this fall (with a possible announcement at WWDC ’18). Mac Otakara corroborated that report in March, hinting that the new HomePod could come in a smaller form factor. And last month, KGI Securities’ renowned Ming-Chi Kuo suggested that Apple has been “mulling” a lower-cost HomePod variant to boost sales. Other reports tell a similar story. On the other hand, we haven’t heard anything conclusive about substantial Siri upgrades or a low-cost HomePod making their debut at this year’s WWDC. While Apple is likely considering these products and updates, take any rumors about a supposed release timeline with a grain of salt. To recap, Siri’s responses to questions about “WWDC” don’t apply to this year’s developers conference. But that doesn’t mean that Apple isn’t working on developments or upgrades that coincidentally line up with those responses.